Dr. Miriam Adelson will be honored by Israeli watchdog group Ometz with an award for her devotion to treating drug addiction in Israel. 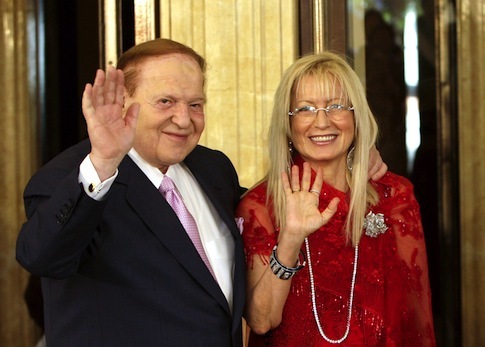 Adelson, an internal medicine specialist and wife of American businessman Sheldon Adelson, helped found the Dr. Miriam and Sheldon G. Adelson Clinic for Drug Abuse, Treatment, and Research at the Sourasky Medical Center in Tel Aviv, according to Israel Hayom. Her program has treated almost 800 patients since its founding 20 years ago. Its innovative treatment requires that all patients have already gone through rehab at least once before. Adelson’s clinic reported that 70 percent of its patients remained sober one year after treatment, which is 40 percentage points higher than the average rate in the United States. "My husband asks me if I miss working as the head emergency room doctor, and I answer him that in an emergency I saved one person from a heart attack, but in this field, with every person you save, you save another 20 people around them—their parents, their children, their siblings," Adelson said. "This is a segment of the population that does not cry out, they are dejected and weakened, and we are committed to giving them the best treatment, for their well-being and for society's well-being." Adelson will also receive an award for her work with the Taglit Birthright Israel program, which helps thousands of Jewish young people travel to Israel. This entry was posted in Culture and tagged Israel, Sheldon Adelson. Bookmark the permalink.